In today’s politically charged clime, there are many ways to express yourself: in a public protest, commenting on a message board, calling your representative’s office, and with your vote, for crying’ out loud. But to reach some politicians more directly, some people get creative. Like this apparent critic of Senator Ben Sasse, a Republican from the great state of Nebraska. 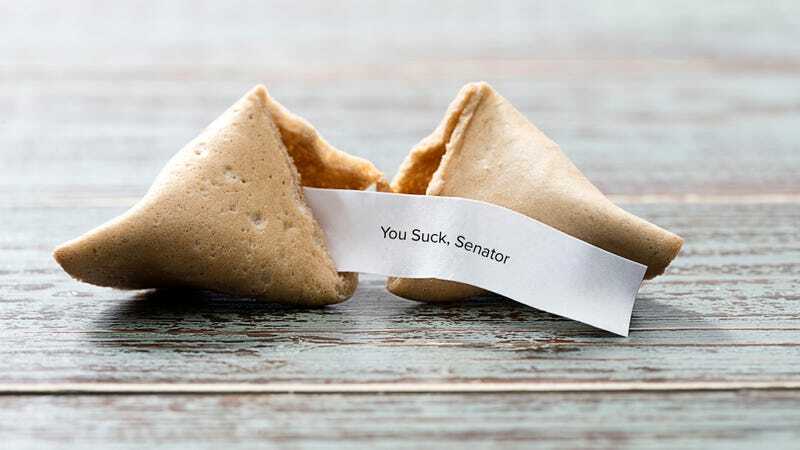 The Huffington Post reports Sasse said on Twitter that he is getting charged messages delivered to him via the unlikely medium of fortune cookies. While, granted, the person behind these messages is an expert prankster, the methodology employed here may be easier than you think. The above Takeout video shows how to update a fortune cookie’s message yourself in less than a minute. Maybe for Valentine’s Day, as part of a super-romantic proposal? Use the fortune cookie as an instrument of good, is what we’re saying, not a vehicle of vague, negative sentiments toward a U.S. senator.